I’ve hit the trifecta – photography, travel and food in one post. I have mentioned several times that I love the idea of traveling but hate to travel. One of the travel goals of many US travelers, including the less adventurous like me, is to travel to all fifty states. The rules are pretty lax – in fact, there are no official rules – but it seems reasonable that you should see at least one notable sight in each state to have it qualify as a visit. 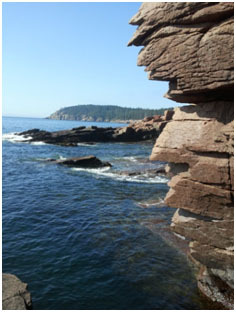 Since I had never been to Maine, I just got back from a trip to Acadia National Park and Bar Harbor. Is it possible to take a bad picture of coastal Maine? I guess so but I wasn’t able to do it, not with my version 1.0 digital camera or with the camera in my cell phone. 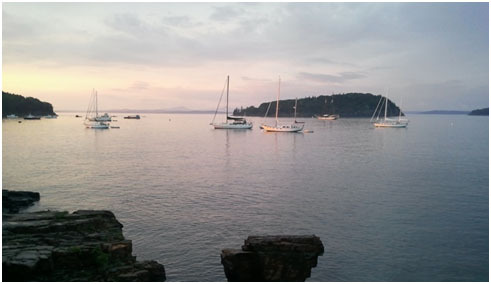 All the usual phrases apply: rugged coast lines, scenic byways, crystal clear streams and lakes, picturesque and laid-back towns (though Bar Harbor, at the height of tourist season, was bustling) and an abundance of fresh lobster. The lobster comes in every form imaginable – lobster bisque, lobster rolls, lobster thermidor, steamed lobster, lobster tacos, lobster quesadilla, eggs benedict with lobster and lobster ice cream (yes, that’s right, lobster ice cream) – to name a few. There is currently a lobster glut in Maine. So much so that lobstermen are refusing to go out for a daily catch because they cannot sell lobsters at prices that pay for their expenses. Bad for lobstermen but good for lobster foodies. 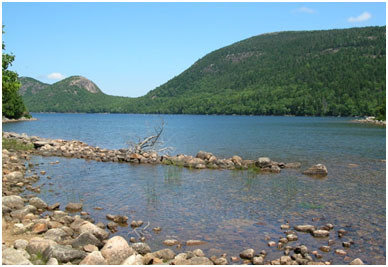 The Island Explorer bus service in Acadia offers free shuttle buses in the summer months to many locations in Acadia National Park. In fact, it is possible to visit without a car at all. 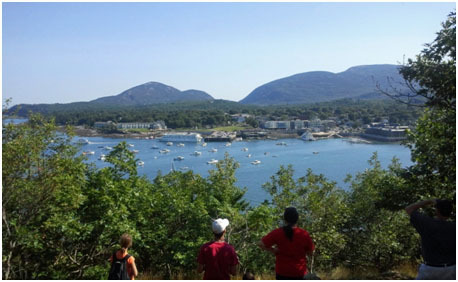 Fly into Bar Harbor airport (technically, the Hancock County Bar Harbor airport), take the shuttle bus to your campground, bed & breakfast or hotel and then catch the bus to sightsee throughout the park. While your car will take you some places that the buses don’t go, you avoid the hassle of looking for a parking space in heavily crowded parking lots at favorite locations. And you get to see more of the views and less of the road, which is the whole point of a vacation. You also get the convenience of being dropped off at one spot, walking or hiking to another and then getting picked up and taken back home. Now in case you are worried that I have become a softie for someone who professes to be a curmudgeon, let me point out that being there was wonderful; getting there and back was a different story. The cattle car atmosphere called modern air travel can spoil the best of vacations. I’ll leave that complaint for another time and give a big thumbs up to coastal Maine. This entry was posted in Uncurmudgeonized and tagged Acadia National Park, Bar Harbor, coastal Maine, food, lobster, photography, travel. Bookmark the permalink. I went to college in Maine for a couple of years. It is now impossible for me to read “Bar Harbor” without thinking “Bah Hah-bah”, with all of the h’s dropped. I hope you enjoyed the lobstah and chowdah. Beautiful, indeed! I’m on the west coast this week, enjoying similar scenery around Victoria, BC. And I made it through my air travel experience without snapping. I didn’t even get selected for my almost-inevitable “random” physical search. Win! The two coasts are very similar in respect to rugged, but beautiful scenery. Victoria, BC is on my list of places to visit. I hope your air travel is without bad experience until you’ve perfected that teleportation device. I am now an unofficial booster of the Maine tourist bureau. While the roads (and Bar Harbor) get crowded, the shuttle buses made the visit stress-free. I can say, without hesitation, that we did not have a bad meal. Unbelievably fresh lobster! It looks beautiful. I think it must be the rough rugged coastline that makes you seem a softie in comparison. I have become an unofficial booster for the Maine tourist industry. As for becoming a softie, I’ll work on that. It’s true: nothing can ruin a nice trip and put you in a homicidal rage faster than the flying cattle car experience.